Chocolate Dipped Coconut Macaroons – easy! 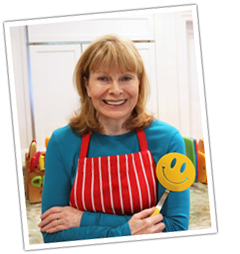 I love easy cookie recipes where you just dump everything into a bowl, stir, drop, and bake. That’s how easy these coconut macaroons are to make. It only takes five ingredients to make these show-stopping cookies and that includes the chocolate. And there’s no butter! 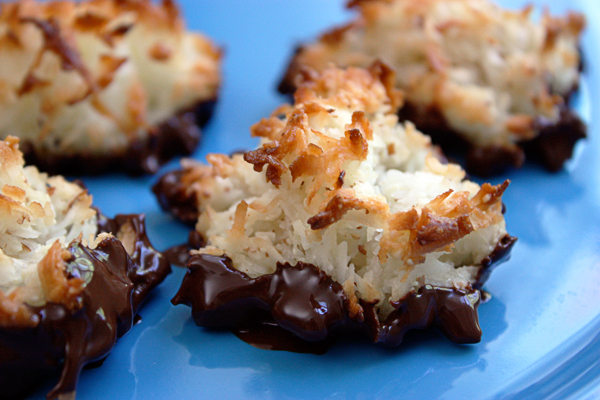 Chocolate-dipped coconut macaroons make perfect gifts. People will think you’re a gourmet baker but this is a foolproof, easy recipe. Here’s how easy it is to make these chocolate-dipped macaroons. Everything but the chocolate goes into a bowl and you combine it with 2 forks. That’s the best way I’ve found to stir it all together. Then I shape the mounds on the baking sheet using the 2 forks but you can use spoons if you like. While the cookies bake, I melt the chocolate. I used to do that in a double boiler where I placed a pyrex bowl over simmering water (the bowl can’t touch the water) but now I just microwave the chocolate to melt it. I check it at 30 seconds and a minute to stir so if you microwave, keep checking and stirring until it’s melted. There are so many ways to add the chocolate. 1) You can cover half the cookie with chocolate and leave half plain. 2) You can drizzle strands of chocolate across the cookie back and forth with a spoon. 3) You can dip the bottom first and then add chocolate to the edges like in the photo. That’s how I usually do it. I found the first few were easy to roll around to cover the edges but when there’s less & less chocolate, I spooned it onto the edges. Then you place the chocolate-dipped cookies onto wax paper to set.